The music of Hawthonn is dense and atmospheric, but not inaccessible. Experimental electronic techniques fuse with doom-laden organ riffs, crystalline piano, elemental drones and haunting vocals. 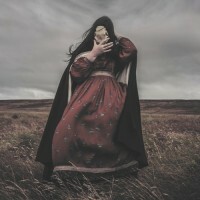 Largely guided by their own unconscious muse, the band’s chief inspirations lie outside of music, in Romantic poetry, dreams and reveries, esoteric symbolism, the history of magic and witchcraft, folklore and the English landscape. Hawthonn is Leeds-based duo Layla Legard and Phil Legard. Having previously collaborated in music, as well as text and photography, they officially formed in 2014 to deepen their uniquely imaginative approach to musicmaking. Often developing from obsessive explorations of a particular theme, their work precipitates dreams and imaginative journeys, which inform the direction of their music. Their earliest music explored the afterlife mythos of Coil’s Jhonn Balance through the image of the Hawthorn tree and Cumbrian landscape where his ashes were scattered. Their approach draws lyricism from the psychoacoustic phenomena of “phantom words”—sonic textures translated from geographical space into droning sound spectra, and verbalized dream imagery. The prime symbol of Red Goddess (Of This Men Shall Know Nothing), is mugwort. An herb associated with dreaming, travel and menstruation, mugwort particularly favors edgelands: those abandoned, untended places, part man-made, part rural, where nature begins to reclaim what humanity has left behind. The music here unfolds a mandala of symbolism from these liminal spaces, drawn from a web of fascinations which unfolded during the recording process.